Am I as happy as I could be? What could I do to be happier? And so she set out on a year long project, focussing on a different area of life each month such as energy levels, marriage, work, parenthood, leisure, friendship and money. She spent a month on each topic - reading widely, critically analysing her own life in that area, choosing one or two resolutions to keep (complete with star charts and working on the basis that it takes twenty one days to form a habit) - to see if and how these things had an impact on her happiness. 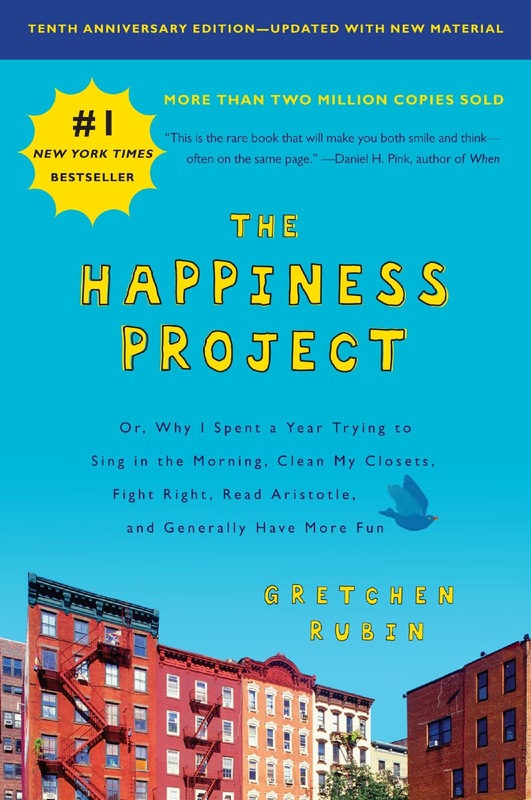 Along the way she recorded her journey and then pulled it altogether into The Happiness Project. I was invited to read this book along with other teachers at the school where I do my relief teaching work as part of a push to improve happiness and wellbeing amongst the staff. Firstly, up front and not so much a criticism as statement of fact, this is not a Christian book and from a Christian point of view it's pretty much a giant box of bandaids. Certainly there are things we can do streamline our lives that will make things better or easier (and therefore probably make us happier) but in any case happiness here and now is not the Christian's ultimate goal. God graciously gives me many good blessings and there is much happiness in my life but ultimately my joy and contentment (close cousins to happiness) are founded firmly in the Lord, with a clear-eyed focus on what is ahead rather than what is happening right now. Secondly, after I had finished reading it I went and read quite a few reviews because I was curious as to how others might have found it. Some absolutely LOVED this book. Others were dismissive. It is after all a #firstworldproblem. I think it's a book you either love or hate, and my theory is that where you fall will depend pretty much on where you stand with making new year's resolutions. If you are one of the NYR naysayers then back your way out of the room and run away fast. This book is not for you. As for me, I love the new year. I love the fresh start. I love ripping the plastic off my new diary, enjoying for a brief moment the look of all those empty pages, wondering at the prospect of what will fill them and then getting into the planning, preparing and dreaming. 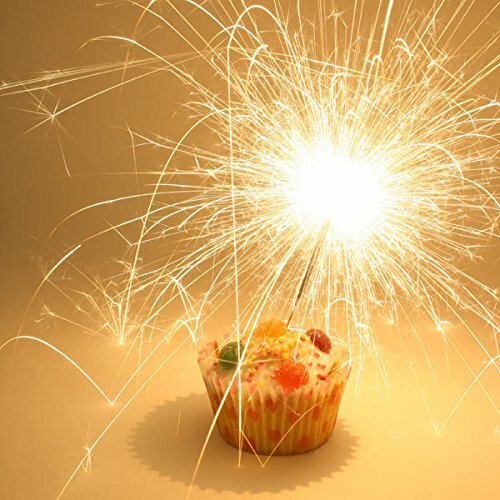 I love January because I also celebrate my birthday fairly early up so it's all new - a new year, a new age, a clean slate. And I think making new year's resolutions is great. For the record I broke my principal NYR for 2019 by 14th January...and that's okay. I'd noticed idly that a lot of people use the term "goal" instead of "resolution," and one day in December, it struck me that this difference was in fact significant. You hit a goal, you keep a resolution. Once you hit a goal - I'm going to run a marathon (not really, I'm just using that as an example) - it's done. But you keep going with a resolution - keep it, break it, run away from it, come back and have another go, hope by the end of the year it you are a little bit further along the track than you were at the beginning. Goals are finite but there is an ongoingness to resolutions. And so I persist with my principal resolution for 2019. It's like the work of growing in godliness. While I found myself sometimes exhausted reading what Rubin got through month after month as she explored, resolved, read, refined and practiced, all while maintaining house, home, family and a job, I really like the principle she set out of having a new resolution each month. Twelve new year's days. Twelve chances to try and tighten things up. Twelve different areas to focus on. Or twelve new chances to work on the one area. All motivated by turning over the calendar to a fresh start at the beginning of each month. For all that I've said, good and critical, I really enjoyed this book - it's a great summer holiday start of the year read. 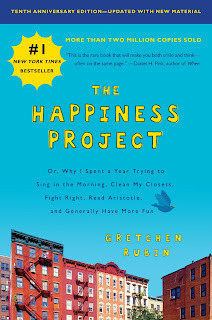 Rubin has a very engaging writing style and she move through lots of topics and ideas within each chapter without getting bogged down (except maybe the chapter on decluttering.) She's read widely and quotes all sorts of interesting, fascinating things along the way. The depth and breadth of her reading is quite amazing and she's very skilled at dropping lovely little morsels all through her writing. The chapters (one for each month) operate reasonably discretely so if you aren't interested in a particular month's focus, you can skip it and move on quite successfully. And of course it is steeped in growing gratitude. There was one very pleasing morsel that I noticed near the end of the book. Slightly Foxed. If you love books and England, you might just want to click on that link. It's a fun book and I'm expecting to return to it next summer. This blog is slowly bursting back into life. Can you put "slowly" and "bursting" next to each other in the one sentence? Anyway, there are definite signs of life. Watching DVDs + crocheting blankets = no reading. And so it stopped for lack of things to say. I stopped reading, apart from the Bible, and then at some point there was a return to the voracious consumption of novels during school holidays, but nothing meatier than that. I really had nothing much to say. Eventually though I'd watched enough Downton Abbey, crocheted enough blankets, read enough novels and took a restoring long service leave trip with my family to Europe - and found myself in the world of paid work. And so it stopped for lack of time to write because between a couple of part time (albeit casual but reasonably regular) jobs, church commitments and house and home (including the new development of complicated but gloriously wonderful teenagers), there was little brain space for thinking creatively let alone time or energy to write anything down. But sometime last year I found myself missing the writing process and my mind beginning to observe the world in sentences and paragraphs once again. My updates on Facebook were getting (ridiculously) longer. The front page of our Christmas letter was more of a blog post than a family update. And just how many paragraphs can you add to your photos on Instagram?? As this was unfolding Tim Challies wrote a lovely series on blogging. Serendipitously, on my birthday he published a post (called "Why you shouldn't stop blogging") that warmly encouraged small time blogging and celebrated, among other things, the opportunity to build relationships and be an encouragement in that space. Which, apart from the gentle art of writing, is the very thing I love about blogging. While I've been away I have forgotten how to do a few things. I tried to reply to a comment someone left (COMMENTS!!! I haven't even checked for comments in ages and sweetly, there were a few waiting patiently for me) and ended up replying anonymously because I couldn't work out how to comment on my own blog. Also I am vaguely wondering about crossing over to Wordpress (are you allowed to mention that on Blogger?? ), taking the best of what I have here with me. Things to work out, relearn and muse over. In the meantime I have a small list of books I am looking forward to reading, a few ideas to write about and I'm encouraged by Tim Challies to stop fussing about the big, spectacular, silver bullet, polished posts and to just write. Which is exactly what I did this evening.